← Teaching Kindergarten…I Mean First Grade: And We’re Looping! I don’t know what it’s like to be a parent of a child with autism. I can’t even pretend to try and explain the thoughts and emotions that parents of children with autism go through on a daily basis. I can’t speak as an expert on autism. The only things I can speak to are lessons that I have learned from trial and error in my room. The thoughts I can share are the ones from me, the general education teacher. And then my principal came to me during one of those last days of summer. I was in my classroom, organizing away. I had everything just about where I wanted it…until her visit. “Paige, I wanted to tell you about a student on your list.” The student was brilliant. The student had a great sense of humor, I later learned. The student loved puzzles and books and the color orange. And the student happened to have autism. This year at school was going to be his first year away from home. I had work to do. I had some reorganizing to do. I had some re-scheduling to do. I had some letting go to do. I had a lot to learn. I don’t think I will ever know as much as I need to know about autism. It seems each year more and more children are diagnosed and there are only speculations as to why this is the case. Some have suggested vaccinations, chemicals, genetics, our culture’s diet…and the list goes on. The fact is that public schools are seeing a rising number of children who fall within the autism spectrum coming through their doors each year. With this change in population has to come a change in the way public educators approach teaching. You don’t have to agree with my thoughts on teaching and autism. There may be nothing that speaks to you, nothing that is profound. I mean, they are just my thoughts from my years of teaching my young friends on the spectrum. I am a general education teacher. I have a master’s degree in Early Childhood Education, not a degree in special education. I am writing my thoughts as a way to share lessons I’ve learned and as a way to honor the individuals who live with autism in a culture that is often not designed for autism. Here is what I’ve learned as the “Gen Ed” teacher of children with autism. Teachers don’t have to panic when they hear the word “Autism”. Yes, the first few times I realized one of my students was diagnosed within the autism spectrum, I felt a tiny bubble of panic, to be perfectly honest. Not because I thought the child would be “bad”. Not because I thought the child would be “hard”. But because I wouldn’t have all the answers. You see, I like knowing just what to do. I like being an expert at something. I am not an expert in the area of autism. I used to fear that I would upset the child, upset the other children, and upset the parents with my lack of knowledge of what to do. And then I realized there would be help. Like “expert” help. That made me feel better, right? Wrong! Knowing someone else was going to come and watch me and possibly point out my wrongs made the bubble of panic grow bigger. I literally had to pray and plead for both humility and self-confidence at the same time in order to embrace the outside help that came with my autistic friends. I needed confidence in myself, in my relationship with the child, and in my teaching and management skills in order to stand firm on points that I knew to be tried and true, no matter what an expert told me. Because the number one expert on how Mrs. Givens’s class runs best is…me. I am not the expert on the class next door. But I am the expert on what works best in Mrs. Givens’s room. I needed humility, too, though, because the outside help that comes in usually comes to do just that. To help! I have met people with many titles who have wonderful points on how to make life and learning easier and more impactful for a child with autism. And sometimes that means that their ideas are better than mine. Between outside resources, the school resource team, parents, and colleagues, I have learned to embrace each journey of teaching and building relationships with parents and children who have autism. The best expert on the autistic child is the child. If you research autism online, you will find a myriad of opinions, facts, stories, and statements. If you talk with ten doctors, you’ll receive that many thoughts on autism. If you observe five different behavior therapists, you’ll see five different strategies for teaching and reinforcing. We are learning together. I have found that the best expert on a child is the child. In any situation this has proven to be true. Relationships are important. It’s important for me to have a good relationship with the team of people who care about the child. Parents offer invaluable help and information, of course. They are entrusting their little ones to me every day. Early on, I decided that honesty was going to be my friend. I try very hard to tell parents when things go well, but also when they don’t go so well, which isn’t always easy for me (I’m gaining humility, remember?). My relationship with parents is invaluable to me. I see their triumph when I tell them their child is having a great week, and I share their tears when we talk about struggles. We celebrate each step together, and those relationships are so important to me. My school is so blessed to have a team of administrators, teachers, resource staff, and paraprofessionals that come to school every day with the best interests of each child in mind. I always know I have support and help as soon as I need it because the relationship between each of us is so strong. They matter, ya’ll. These relationships are important! There will be hard days. Yes, there have been hard days when I felt like I didn’t serve my autistic students and my non-autistic students in the best of forms. There was one day when a student locked himself in the bathroom crying. Then there was this one day when I locked myself in the bathroom crying! And guess what? click. “Why didn’t you say so, Givens?” Super tight hug. Sigh of relief. Heart overflowing on this hard day. There will be awesome days. These are the days I love. On an awesome day, a student carries on a real conversation for several turns. A student who only eats one food ventures out very bravely and makes a new food choice. A student steadily walks up to a group of kids and starts playing with them, and with little to no prompting keeps up the positive interaction and builds a friendship with her classmates. And if I really think about it, every day is an awesome day. I get to see students who are so profound and just genius on so many levels grow right before my eyes. I have seen a student put any puzzle together in a matter of seconds. I have seen a student who could remember any printed word that was ever put in front of her. I’ve had hugs, high fives, and high tens. I have guffawed at an inside joke that I was honored to share in with my little friend. Every day that my students impact each other and myself with words and actions is awesome. It’s a gift. I signed up for this. I’ve been able to attend a number of professional development activities that deal with autism and the general education classroom. At one such event, I heard a murmuring behind me…”When I went to college to be a teacher, I went to be an elementary teacher. I didn’t sign up for this.” Whatever this was for her, I’m not sure. But her comment caused me to think about my own teaching ambitions. I signed up to teach young children. ALL young children. I went to college, I research, I attend professional development sessions, and I collaborate with my colleagues in order to teach all children. Teachers, yes, you did sign up for this when you marked “Education” on your college application. If you are called to be an educator, then you educate everyone who is made available to you, regardless of their behavior, learning abilities, and their social standing. I have many things to learn about autism. About teaching, for that matter! But I think one of the most important things I’ve ever learned came from my precious friend, neighbor teacher, and mentor. When I found out for the first time that I was going to have a student in my class that was diagnosed with autism, I went straight to Mrs. Jernigan for help in setting up my room and routines. While she was helping me, she said, “When you accept and love the child for who he is, you will have so much joy in teaching him and seeing him grow.” She was so right, of course! I have had so much joy in seeing my friends who live with autism take steps big and small towards success. April is Autism Awareness month. There are many organizations who are working to increase awareness and support for autism research. To learn more about how you can help, visit the sites below. This entry was posted in Teaching and tagged autism, Autism and General Education, Autism Awareness, teaching. Bookmark the permalink. I truly LOVE this post and you are obviously an amazing teacher for you learned the most important thing! Get to know the child and love them for who they are and teach them in the way they learn best! Great article Paige. I have learned over the years what works for one may not work for another. This is true with all students and classes each year. Loving my students comes first, keeping them safe is second and getting them ready for first grade is third. You see if a child feels loved and safe, the learning come automatically whether they have a learning disability or not, whether they are a child of autism or in the spectrum. Love is what we all want. You are so right. When we signed up for this, it was to teach all children. For some, it is a job but for others it is a calling. One that God has called us to do. He has called and entrusted us with His most wonderful creation. They are called children. Thank you for taking the time to write about this and to share your thoughts and your heart. Love you sweet friend. Thanks Connie. Love you too, friend! You’re a great teacher! You are awesome. You were smart enough to seek help! Thank you so much for encouraging me. I appreciate it more than you know! Paige – thank you for this post. I’ve been thinking about it all week and it’s really encouraged me as I prepare to send my child with autism to public kindergarten next year. I’m caught up in all the process and paperwork right now, but I’m encouraged to hear a teacher’s perspective. As nervous as I am about next year, it’s helpful to know his teacher probably will be too. Helpful to remember that it’s not just the paperwork, but the people – and the people (I pray) will truly care about him, and not just care about what’s written in his paperwork. It’s a tough journey for everyone – the child, the parents, the family, and the teachers. I’m so grateful for the whole team we have – his preschool teachers, his therapists and the teams to come. Thank you for encouraging everyone to remember these are children who want to learn and be accepted and be loved. They can be a challenge, but they can also be so incredibly wonderful, too! I don’t know where you are from Paine Givens and I don’t usually reply to blogs and such however, this is worth a shot. I want to first start by telling you how much I appreciate you as a person. It is about 3am in the morning as I write this to you. As a mother of a newly diagnosed three year old it brings great relief to my soul to know that there are people such as yourself in this world. This may be a long shot in the dark but I would love to meet you. You are just the person I need at my son’s autism awareness event this month to say every last word right hear on this blog. I would appreciate if you could let me know what you think. If I could reach out and hug you I would we need more educators such as yourself and the passion and understand you bring to the table. I hope to hear from you soon and may Allah continue to work through you. God bless you and thank you so much for caring so much about each child. I wish every teacher had your heart and desire to teach each child as they are. My child has had some awesome teachers that were willing to teach him on his level and when that happens he does so well but we have had some that refused to learn what he was capable of and when that was the case it was a horrible experience for everyone involved. I pray every year that my child’s teachers are there to teach him on his levels as much as they are there to teach the typical well adjusted child. God made each of us just as he had planned there for no one should ever be made to feel they are not perfect or accepted by others. 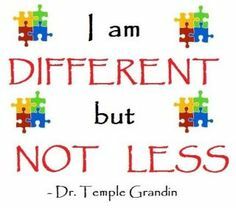 My child’s experience is that he is told so often what he has done wrong that he feels and knows that he is different. i pray that others will learn from your experience and to learn that loving the child first and foremost is the most important thing a teacher can do. Thank you so much for sharing Mary! I hope every year will be a great year for your son. It’s what all students deserve! Pingback: What I’ve Learned About Autism in My General Education Classroom | So, You Think You Can Teach ESL? Great article by a super teacher. I always loved that you loved your students so much! That’s what great teachers do- love their students unconditionally like they do their own children! That’s what you did, too, Mrs. Parker!